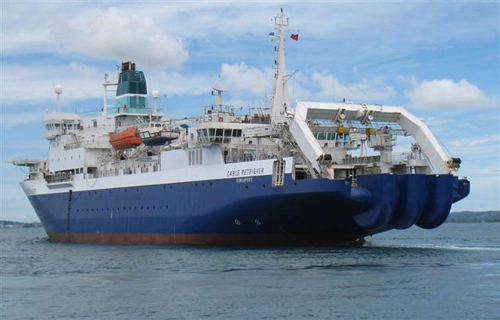 Global Marine Systems Ltd (www.globalmarinesystems.com/) is in the process of converting six of its cable installation and repair vessels to begin using the latest Makai software technology. With the addition of GMSL to the list of customers, Makai software products are now used by every single large installer and most of the smaller telecom cable installers in the world, accounting for more than 80% of the world’s cable installation fleet. The Makailay Seismic module which will enhance the capabilities of GMSL in accurately installing and retrieving seismic arrays for the oil and gas industry. Two of the new systems have been already delivered and the rest will be delivered and commissioned before the end of the year. A training program will be conducted in August 2013 at GMSL headquarters in the UK. In addition, GMSL has also embrace MakaiPlan as the preferred submarine route cable planning tool for their survey department. MakaiLay is an advanced finite-segment 3D cable installation software package that enables cable installers to lay submarine cables with high placement accuracy and reliability. The software calculates and displays the surface and seafloor tension of the cable in near real-time, the layback distance of the cable, the cable slack and touchdown locations on the seafloor, to enable complete control of a cable installation process. MakaiLay fully integrates the cable laying operations with the cable control room to adjust the cable payout speed for optimum slack/tension, the plough control room, and the helmsman DP system to modify the vessel track and speed as needed. The software can receive real-time ocean current data from Acoustic Doppler Current Profiler (ADCP) instruments to model the effect of ocean currents on the suspended cable and touchdown position. Using MakaiLay, engineers can then create a new ship plan on-the-fly to compensate for the effect of ocean currents in order to maintain a high placement accuracy of the cable on the seafloor. The new MakaiRepair software extends the capability of Makai’s submarine cable planning and installation software suite to include at-sea cable repair and recovery operations. MakaiLay Seismic has been specifically designed to address the new challenge faced by the seismic industry to accurately install and retrieve Ocean Bottom Cables (OBC) with many in-line sensors in mid- and deep waters.